Focusing on the 1970s fiscal crises in New York City and in Cleveland, Ohio, TIGHTEN YOUR BELTS, BITE THE BULLET looks at the root causes of fiscal crisis in American cities, and the political responses to it. Using animation, news footage, and exclusive interviews, the film is an enlightening history of a difficult period. Screened at the 1980 New York Film Festival, TIGHTEN YOUR BELTS, BITE THE BULLET provides rare insight into the economic and political environment in which the Times Square Show was produced. Martin Lucas, Department of Film & Media Studies, will introduce the film. 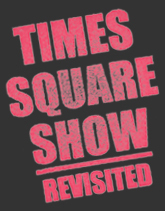 Charlie Ahearn, Diego Cortez, Jane Dickson, and Robin Winters discuss the Times Square Show and its impact across disciplines and over time. Moderated by David E. Little, Curator of Photography & New Media at the Minneapolis Institute of Arts. Refreshments provided. Learn about the art, archives, and mission of the Keith Haring Foundation. Explore questions such as: How does an artist preserve and extend an artistic legacy? What primary resources do artists’ foundations preserve? How can a studio evolve from one kind of workspace to another? What career opportunities are available at institutions like the Keith Haring Foundation? This visit is especially targeted to MFA students. Space is limited. Email Annie Wischmeyer (awischme@hunter.cuny.edu) by 10/12 to reserve a spot. Learn about the art, archives, and mission of the Keith Haring Foundation. Explore questions such as: How does an artist preserve and extend an artistic legacy? What primary resources do artist foundations preserve? How can a studio evolve from one kind of workspace to another? What career opportunities are available at institutions like the Keith Haring Foundation? Times Square has long been the epicenter of festive, rapid, chaotic urban life. Yet the way we experience this mega-screened spectacle in 2012 differs from the way it was experienced in the past, and specifically in the 1980s. These three key video works made about and in Times Square highlight its transformation: from Burckhardt’s innocent Square Times to the hyper-stimulated advertising of This is Not an Advertisement and the pastiche remix of Time Squared. By the end of the 1980s, Times Square has grown cynical and dark, but nonetheless appears in brighter and more spectacular hues. Curated by Carolyn Kane, Department of Film & Media Studies. This screening of the landmark horror film will be introduced by Adam Lowenstein, professor of film studies at the University of Pittsburgh and author of Shocking Representation: Historical Trauma, National Cinema, and the Modern Horror Film (Columbia University Press, 2005). Lowenstein will also lead the audience in a discussion after the screening. Refreshments provided. Organized by Isabel Pinedo, Department of Film & Media Studies. Taking cues from Colab&apos;s success in realizing projects through public funds and fellowships, representatives from Independent Curators International, Lower Manhattan Cultural Council, and the New York Foundation for the Arts will coach students on maximizing resources available to them as emerging professionals in their fields. Refreshments provided. Presented with the Department of Art’s Art History MA Student Organization (MASO) and MFA Student Organization (MFASO). Email Annie Wischmeyer awischme@hunter.cuny.edu by 11/1 to reserve a spot. The Hunter College Art Galleries is grateful to the Keith Haring Foundation Inc. for making the educational public programming presented in conjunction with Times Square Show Revisited possible. We thank the Solo Foundation for their support of the panel discussion and express our appreciation to the individuals and organizations participating in these events, with special thanks to Andrew Lund, Department of Film & Media Studies.